45 refugees and asylum-seekers now living in Canberra have been given an education head start thanks to the generosity of the local community. Scholarships awarded during United Nations World Refugee Week by Canberra Refugee Support Inc will help primary, secondary and higher education students with the costs of their education. The scholarships provide funding assistance for compulsory fees, computers, books, sporting equipment and the many other costs associated with their education. One of the refugees who was awarded a scholarship is Farishta Arzoo. Farishta is an Afghani who was born in Pakistan. She came to Australia in 2015 with her mother and two younger siblings. 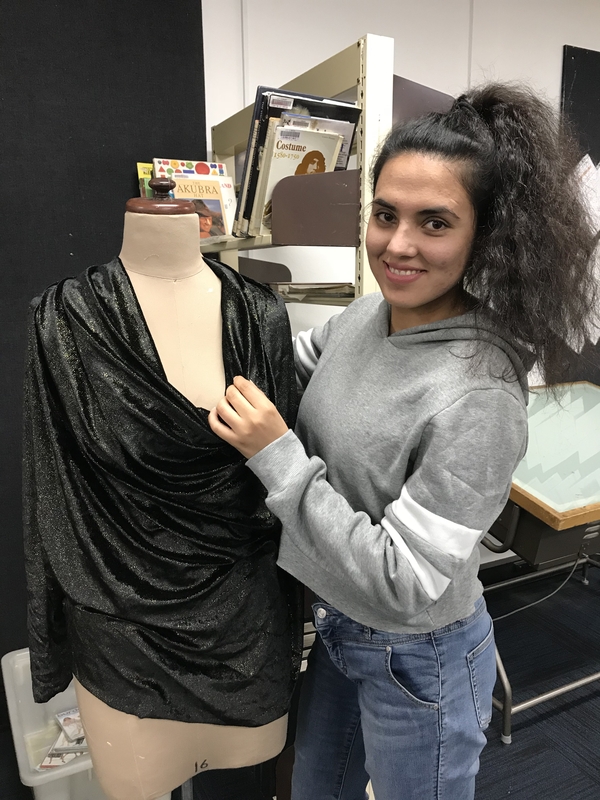 Farishta completed the Certificate 4 in Spoken and Written English for Further Studies last year, and is now studying full time at the CIT in Reid for a Diploma in Fashion Design. Farishta is also dealing with the demands of supporting her family in their settlement in Canberra. Her mother speaks very little English, so it has fallen to Farishta as the oldest daughter to take on the role of dealing with most of the management of the household. Farishta wants to pursue a career in ‘red carpet’ fashion design and hopes to complement this with a degree in arts at university. Another scholarship winner is Akur Thiong Akur. Akur was born and grew up in a refugee camp in Kenya. His mother and father had fled from the fighting in South Sudan in 1993. Akur came to Australia in 2013 and is doing Year 12 at the CIT in Reid. Akur says that his dream is to go on to university and become a lawyer so that justice is available for all refugees. I will use the scholarship to help pay my fees. I will also use it to help with my older sister’s education; and I want to help my cousins who are still in the refugee camp in Kenya. They don’t have any money, so they can’t access education there”. The scholarships were awarded at a ceremony at the Theo Notaras Multicultural Centre in Civic to mark World Refugee Week. The awards were presented by Ms Rachel Stephen-Smith MLA, Minister for Multicultural Affairs and Mr Nai Jit Lam, Deputy UNHCR Regional Representative in Canberra. All scholarships are gifts from the Canberra community. They have been donated by church groups and service clubs, as well as by private individuals. President of Canberra Refugee Support Doug Hynd said the awards strongly support the ACT government’s formal declaration of the ACT as a Refugee Welcome Zone. Dr Hynd said “These awards will help young refugees get the education they need to become citizens who contribute to the ACT and advance our community, economy and social life in so many ways. 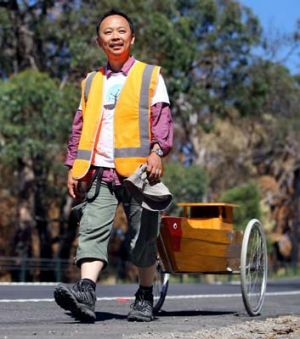 The Canberra Refugee Support scholarship program, now in its 14th year, has been praised by the United Nations Refugee Agency (UNHCR). 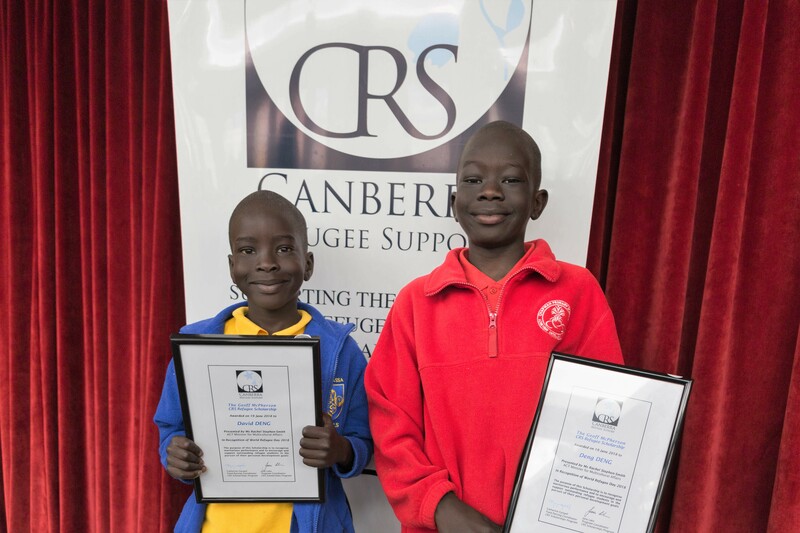 To mark UN World Refugee Day each year, Canberra Refugee Support sponsors a refugee scholarship program to recognise and support refugees in Canberra. 2017 was the thirteenth year a public scholarship program has been delivered. This is probably the most significant event in the CRS calendar which is held in June at the Theo Notaras Multicultural Centre in Civic. Scholarships are awarded to Asylum Seekers or Refugees who are studying or seeking to study at CIT, IEC or at other institutions while they are living in Canberra. Winners are selected on the basis of meritorious performance rather than academic results alone. 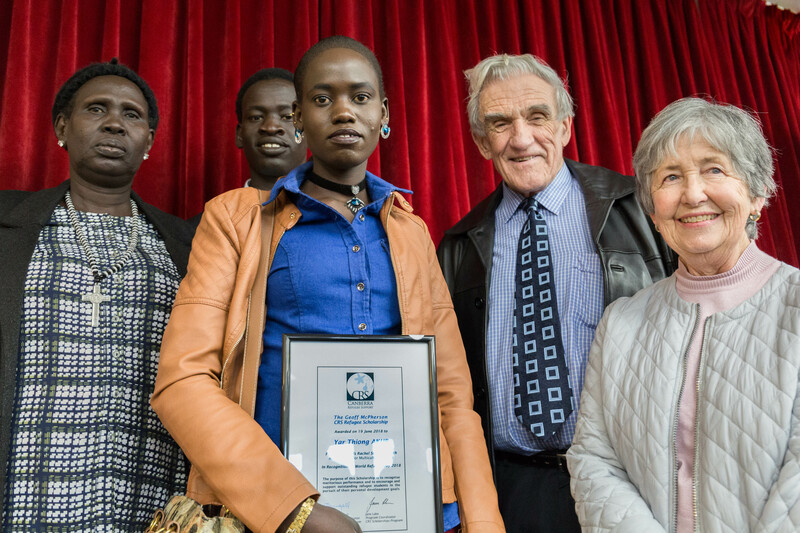 The CRS Refugee Scholarship Program has grown from a modest “one-off” presentation, to an annual event with support from a very wide section of the ACT’s community. In 2017, in total, 52 scholarships with a total value of $31,500 were awarded. 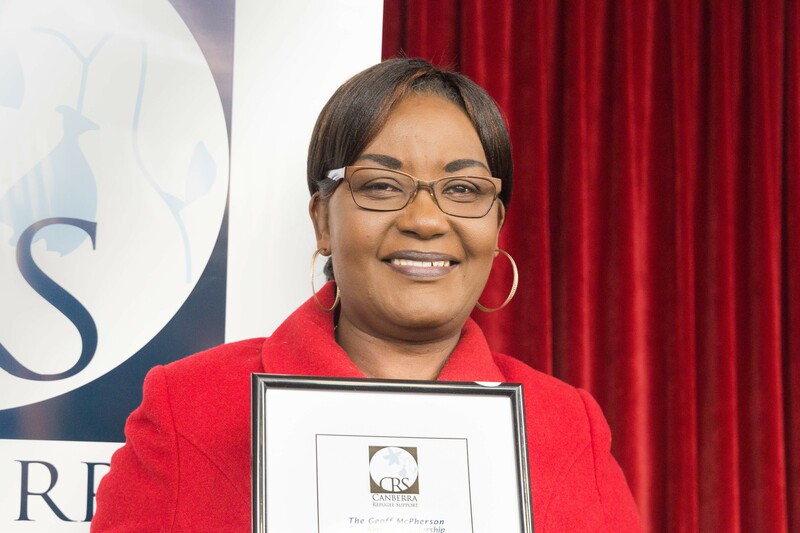 Awards ranged in size from $300 to $1000 and were spread across primary, secondary and adult students with slightly more male than female recipients and nearly 60 per cent of the awards going to school and college students. The Scholarship Program is funded from donations. Our 56 donors consisted mainly of individuals, but also represented were churches, schools, other non-government organisations, government departments and their staff and an international agency. We are grateful to the many donors who support the refugees who have settled in the Canberra region. Thanks again for this effort must go to Catherine G, who repeated her outstanding work from last year – and the two years before! Support for, and knowledge about the program is increasing rapidly. Articles in the media about the scholarships program have appeared in The Canberra Times, The Canberra Weekly, City News, The ACT Public Service ‘PSNews’ and a media release by the ACT Minister for Multicultural Affairs. There was also a mention of the program on radio RN on Saturday morning. Our MC for the event was the well-known and much loved (now retired) ABC Local Radio 666 presenter Alex Sloan, who as for the last three years, did a marvelous job to keep the event moving and flowing. 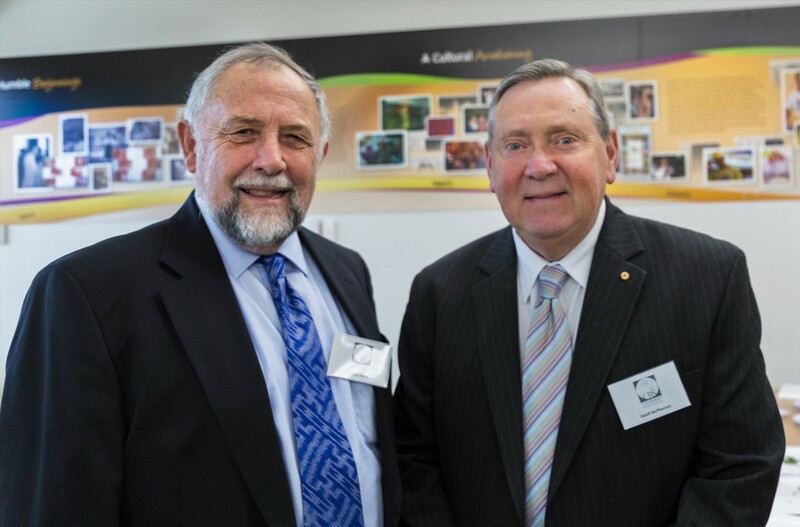 The President of CRS, Doug Hynd, noted in his introductory address that Alex is this year’s Canberra Citizen of the Year, a true reflection of the affection and respect in which she is held in Canberra. Alex was recognised for her services to the community of the ACT, through her commitment to telling the stories of Canberrans over 22 years in local radio and through her selfless support of a range of community organisations and charitable events. In his address, Doug officially opened proceedings with an explanatory address about the program, and welcomed recipients, CRS members, other supporting guests and a delivered a special thanks to donors. The Keynote Speaker was Ms. Natasha Yacoub, representing the Regional Representative of the UNHCR, Thomas Albrecht, who was unable to attend. Natasha gave a thought provoking and supportive addresses. The Minister for Multicultural Affairs in the ACT Government Ms Rachel Stephen-Smith MLA was another official guest, and likewise delivered a supportive and encouraging address. Doug Hynd, Natasha Yacoub and Rachel Stephen-Smith then jointly presented scholarships. Congratulations to all of the 2017 scholarship winners. We have many people to thank for making the event possible. 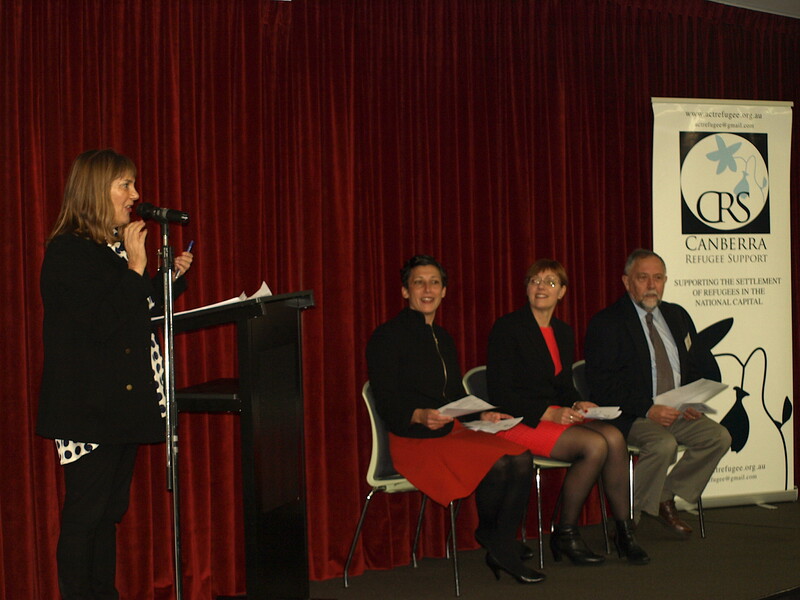 Firstly, our nominators: Canberra Institute of Technology; Companion House; Australian Red Cross; Navitas English, Canberra; and the ACT Education and Training Directorate, including the Introductory English Centres and the Dickson College Refugee Bridging Program. Secondly, our organisers. The program was run this year by a team of Chris A (coordination), Catherine G (fund-raising), Judy L and Jane L (nominations), and Brian C (media and logistics), all of whom did a terrific job, with further assistance, particularly on the day, by Morna W, David C, Virginia B, Jane C, Alison T, Colleen F, Steve W, and Christine C. The thanks of all CRS members go to them and to all who helped in so many ways. Without these dedicated volunteers the event would not have been possible. Finally, our donors. We rely on the generous support of the Canberra community to make this event possible every year. We highly value our links with all the people and organisations with whom we work to assist refugees in our local community. We are particularly grateful for the generous sponsorship we have received for scholarships, and recognised their contribution on our program of events.